Grippers activate jaws or fingers to pick up, hold, or move work pieces in an automated or robotic system. The gripping elements can be angular or fingers that pivot about base points or jaws that slide parallel or in the same plane with each other like clamps or chuck jaws. Grippers may be actuated manually, electrically, pneumatically, or hydraulically. 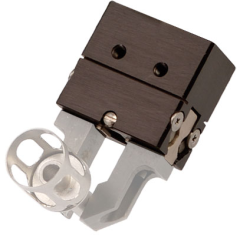 Manual grippers are actuated by hand crank, wheel, levers, or other manual or mechanical means. Electric grippers fingers or jaws are actuated by electric motor, solenoid, etc. Pneumatic grippers are actuated by compressed air acting on a cylinder or vanes. Hydraulic grippers are actuated by hydraulic fluid acting on a cylinder or vanes. Many configurations and numbers of gripping elements are available. The number of grips on grippers generally range from one to six, but greater numbers are available. Gripper action can be single action, double action, double action spring assist open, or double action spring assist close. Single action grippers contain drive in only one direction. Single action grippers frequently incorporate a return spring to the unpowered position (supply press ure or electricity off. Double action grippers are actuated both open and closed. Force ratings can differ in the two directions. Double action spring assist open grippers have an actuation method that opens and closes the gripper, but with spring assist in open direction (spring opposes closing). Double action spring assist close grippers have an actuation method that opens and closes the gripper, but with spring assist in the close direction (spring opposes opening). Parallel grippers have their own set of specifications. These include gripping force, stroke and gripping size. Gripping force is the available force for gripping at the rated power. Note that jaw force is not additive; two jaws each rated at 10 lbs. force, for example, will provide a total gripping force of 10 lbs. The stroke is the available motion for each jaw or finger; half of total. A multi-jaw parallel gripper that can grip an item from 1 to 2 inches in diameter, for example, will have ½" stroke for each jaw or finger. Gripping size is the grip size for actuated gripper; user may specify range. Grippers frequently allow for custom machined fingers or jaws to be attached. 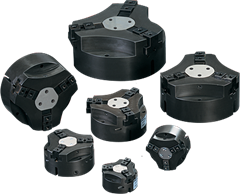 Angular grippers have a specific set of specifications. These include gripping torque, angular stroke, 180 degrees open, and gripping size. Gripping torque is the available torque for gripping at the rated power. Torque can be divided by distance from pivot to obtain gripping force. Note that jaw force is not additive; two fingers each configured to grip at 10 lbs. force, for example, will provide a total gripping force of 10 lbs. Angular stroke is the full operational angle for each finger. This is half of total. Fingers that open 120°, for example, will each have a stroke of 60°. 180 degrees open implies that fingers open 90° or more each for total part clearance.